It wouldn’t take a rocket scientist to know that a reliable watering system is necessary if you want to keep your lawn lush and green. However, there are certain intricacies to this chore and it can be too time-consuming for a regular homeowner to do manually. The best oscillating sprinkler can simplify the task, however. If you’re thinking of installing some yard sprinklers to help make your lawn upkeep simpler, stick around as we might be able to teach you a thing or two. Is an Oscillating Sprinkler the Right Pick for You? Alongside the best fertilizer lawn spreaders, the best lawn sprinklers can also play a huge role in making your lawn care chores simpler. They can automate the key tasks that you need to accomplish, so they can really come in handy if you want to spend less time tending to your law without sacrificing the output. According to experts, you’ll need to water your lawn thoroughly and infrequently if you want the best results. The green grass of your home will also require a specific amount of water at the right time of the day. This makes the task trickier. If you have a relatively big lawn that you don’t want to work on manually, the most efficient solution would be to get the best sprinkler that will help you complete the chore. These devices will handle most of the task for you. In turn, you just need to find the best product for your property and install it properly. However, there are several different water sprinkler systems that you can opt for. Sprinklers come in various designs and not all can be suitable to the requirements of your lawn. This is why choosing the right device is essential if you want to ensure the best results. You have several options and you can choose depending on the layout of your lawn, the spray pattern you want to get, and even the ease of installation. The best above ground sprinklers won’t require fussy installation, so they can really come in handy. A good example of such are spike sprinklers. You’ll only really need to stake them to the ground and hook it up on a hose and you’re good to go. If you need to cover a large area, the best impact sprinkler would be a good pick for you. The best pulsating sprinkler is also an option as they can also cover large areas and are often very easy to install. Oscillating sprinklers, however, are more versatile and tends to suit more homeowners’ requirements. Due to their rectangular design, they can easily provide ample coverage for rectangular lots. You can also easily scale their coverage. You can set them to have a wide fan spray or a short-range coverage for smaller areas. They’re also excellent portable sprinklers so you can easily move them around. This gives you frees you from the need of damaging your turf just to install a sprinkler system. This also makes it a great choice if you’re tired of replacing your sprinklers every so often due to substantial blunt force damage. You can always opt to stash this unit away after use so you can rest assured that your kids, pets, or neighbors won’t break your sprinkler. Its key offering, however, is its high spray which makes its water output gentle enough for flowerbeds. Their water spray won’t damage delicate landscaping and ornamental plants so you can be guaranteed that they’ll help you keep your lawn in excellent shape. However, just like the other types of lawn sprinklers, you still need to find the best oscillating sprinkler if you want to get the most out of these devices. How exactly are you going to do that? We’ve rounded up the very things that you should look into when choosing the best oscillating sprinkler, so check them out below. The best oscillating lawn sprinkler would be, without a doubt, are durable ones. This is why you should pay close attention to the quality of the unit you intend to get. Metal sprinklers are always preferred as they’re less likely to break compared to plastic ones. Aside from the material, the construction should also look and feel substantial. If parts of the device feel flimsy, stay away from it. This can cause issues such as puddling in some cases and that can lead to complications related to overwatering. The number of holes in these best lawn sprinkler heads can also affect their performance. More holes offer more coverage, so if you only need a small sprinkler, you should look for products with fewer holes. This design will help you limit the spraying range of your unit. The ideal number of holes for a good-sized area is 18. This will already provide the efficiency you need to cover about 20 to 30 feet. At some point, you’ll need to disassemble your sprinkler for one reason or another. So to ensure that you won’t struggle in the process, it’s best to just look for one that won’t be too hard to assemble and disassemble. One of the biggest charms of oscillating lawn sprinklers is that they’re very flexible. However, a unit that’s hard to operate and use defeats the purpose. This is why you should look for something that’s also easy to use. Make sure to look for something that you can attach to a hose without a fuss. It should also have adjustable knobs that are easy to work with. If you intend to leave the unit out all day, you might also want to look for something. These will help you ensure that you can use your yard sprinkler without breaking a sweat. The best sprinklers should also offer you great bang for your buck, so consider your budget as well. Look for something that will give your money’s worth in terms of quality and performance. To further ensure the quality of the sprinkler unit you’re getting, look at its warranty coverage. A product with a reasonable warranty and a friendly price tag will be a great choice for many households. Before we move forward to the top-rated oscillating sprinklers in the market today, we must note that this type of lawn irrigation system isn’t for everyone. When used in certain circumstances, it might not offer the best results, so you should make sure that it’s the right match for you before purchasing one. If you have low-hanging trees or if you live in windy areas, this might not serve as the best sprinkler system for you. Due to the high height of its water spray, the water might not reach the ground if you have trees with low hanging branches. The water can also evaporate faster or be pushed in a different direction away from your lawn in windy areas. If you have kids, however, these would be great options. Not only is it because you can stash it away every after use. With this, you don’t have to worry about your little ones tripping and getting hurt by in-ground sprinklers. It’s also because it releases a good amount of water that you can even further adjust. This will make hot summers more bearable and fun because they can splash about while playing out in your yard. If these conditions match yours, then an oscillating sprinkler can be the best lawn sprinkler to meet your lawn care needs. Want to know what the best oscillating sprinklers are like? The six items below can help you get to know them better. They are not just the top-rated oscillating sprinklers in the market today but they can also help you learn what to expect from such devices. With their help, you might just be able to find the right pick for your lawn. For other types of these watering devices, you can also check this out to read the best lawn sprinkler reviews for perfect grass. Leading this list of the best water sprinklers is the Sun Joe SJI-OMS16 Indestructible Metal Base Oscillating Sprinkler. As its name suggests, its main draw is its durable construction. Don’t be fooled by its bright color and appearance as this product is not made of plastic. What makes this item ‘indestructible’ is its aluminum base construction. It’s just painted really nicely so it can appear like its base is made of plastic. Once you see it in person, however, you’ll realize that this adjustable sprinkler looks and feels substantial and durable. You certainly don’t have to worry about high water pressure causing it to move around and shoot water everywhere when in use. While its nozzles are made of plastic, they’re of the heavy-duty kind. This is why you can also be guaranteed that they won’t require a lot of maintenance to keep them in top shape. They can also last a long while, especially if you take proper care of the unit. Performance-wise, this product guarantees to cover about 3600 square feet so it can definitely be a nice choice for a sizeable residential lawn. With 16 non-clog nozzles, you are also offered precision. You’re promised that it won’t create an overspray and waste water in the process. Another solid feature that you should know about this product is its leak-resistant connection. This guarantees that water won’t spill right where the hose and the opening for the sprinkler connects. This means that it won’t waste water and that it won’t create a puddle and drown the grass in the area you chose to put it. This item also comes with a nice extra: a cleaning needle for the nozzles. This allows you to easily de-clog the nozzles so you don’t have to fuss over the unit just to ensure its top performance. It may not seem like much but if you want to ensure that your sprinkler is free of all kinds of debris, this add-on can really come in handy. Looking for the best sprinkler for large lawns that will fit your budget? The Melnor XT Turbo Oscillating Sprinkler with TwinTouch Width Control & Flow Control is a nice option to look into. This product offers everything you need in a good oscillating sprinkler and more, so it can really promise great bang for your buck. What makes this product worth your hard-earned money is its solid construction. While this is the high-impact plastic base variety (there’s also a variant with metal base), you are guaranteed sturdiness. Some crucial parts are made of metal, including the hose connector, so you can expect it to last a while. You definitely won’t wear out its treads easily even if you opt to store the sprinkler every after use. Its 18-count nozzles are also made of substantial malleable silicone plastic so you’re guaranteed that they’re durable. This also makes them easier to clean as you only really need to apply some pressure to its tips for them to release stuck debris. If you can’t clean it fully manually, this unit also comes with a cleaning tool that also serves as an end plug. You can just use that to poke out the debris in the nozzles and unclog your sprinkler. This product is also meant to be used as a large area sprinkler. It can cover up to 4200 square feet so it can certainly be an effective option for larger properties. This is made possible by its Turbo technology which makes the water come out in a mini-tornado fashion. Unlike regular sprinklers that release water in straight jets, the water released from this sprinkler spins out. This means that it uses extra force to push the water up which then allows it to reach higher heights and land farther. Another plus about this product is its easily adjustable spray settings. You can easily adjust the length and coverage area of its water spray by just pulling the dedicated levers on the body of the unit. They’re labeled so you won’t have a hard time choosing the settings you need to thoroughly and efficiently water your lawn. For something heavy duty, the Green Thumb 4200 MGT Green Thumb Heavy Duty Metal Oscillating Sprinkler is for you. This item is made to be tough with its steel base so you can rest assured that it’s plenty sturdy for the job it has to do. For most folks, an oscillating sprinkler with a metal base is the most sound option because of its stability and sturdiness. It’s definitely heavy enough to stay in place when the water pressure in your area is strong. It can also guarantee to withstand the harsh outdoor elements that can turn plastic materials brittle and weak. All of these make this Green Thumb product a solid pick for many households. Its nozzles may be made with plastic but they’re guaranteed to be durable as well. Releasing debris and unclogging them is pretty easy, too, so you don’t have to worry about them affecting the performance of this water sprinkler. Aside from its construction, what makes this product in the running for the best garden sprinkler title is its intuitive design. You can control the water pressure or the length of the water jets right on the unit. This makes it a lot easier to use as you won’t have to run back to the faucet to prevent runoffs and avoid damaging your well-manicured lawn. Aside from this, you can also easily adjust the width of the spray with just one touch. This allows it to be a lot more versatile. If you have to water several patches of grass in different shapes and sizes around your property, this item can already be enough to get the job done with it adjustable settings. Like the Melnor XT Turbo listed above, this unit can also handle a relatively large area. It has 18 nozzles so it has a nice water dispersal coverage. Thanks to its turbo drive motor, it can also shoot out water in longer, spinning streams. This allows it to cover up to 3900 square feet. The only downside to this product is that it has other parts that are made of plastic. Some folks consider such as potential points of failure. If you want utmost control over how your sprinkler will release water, the Melnor XT Mini-Turbo Oscillating Sprinkler is something you should check out. This product has a relatively unique design that will let you tailor fit the sprinkler’s performance according to your exact liking. As its name notes, this is a mini oscillating sprinkler. It’s smaller than the other Melnor XT product listed above. Instead of having its sixteen nozzles all lined up, it has them in two rows. This makes it a great sprinkler for small areas, especially if you have a narrow but elongated lawn. You don’t need to worry about the water overshooting to the road, fence, or nearby structure as its spray width is pretty limited. Despite its compact design, however, it can still be quite versatile. You can still opt to fan out the spray as the unit is highly adjustable. It can cover up to 3900 square feet so it can still be a good choice for a lot of households. If you need more coverage, it’s also possible to create a daisy chain of three to four units of this sprinkler. This might require strong water pressure, though, so you should still consider that factor before buying multiple units. Aside from these, it’s also possible to rotate the sprinkler head. You can move it 360 degrees around so you can easily position this lawn irrigation device whichever way you want to do so. This makes it a lot more versatile and gives you more ways to control how you’ll water your lawn. Like the other items in this best yard sprinkler list, the other functionalities of this item are also easily adjustable. There’s a knob for the pressure flow and levers for the width and height of the water spray. These will let you further customize how you want to disperse the water on your lawn. In terms of construction, this Melnor XT product is also quite sturdy. It’s made of high-impact plastic so it can certainly durable. It also has a detachable plastic sled base so you can be guaranteed that it will stay in place while in operation. Note, however, that this item doesn’t have a nozzle cleaner. The nozzles are easy to clean, though, so it shouldn’t be much of an issue. Due to their malleable silicone material, you can just rub them and you can already squeeze out the stuck debris if there’s any. If you’re not a fan of sled bases, you can opt for the spike base for this product. Tired of replacing your sprinkler yearly? 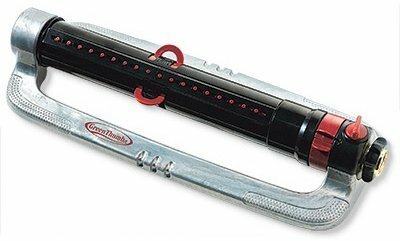 Then check out the Gardena ZoomMaxx Oscillating Sprinkler. This product offers durability with an intuitive design so it might just have everything you’re looking for in a lawn irrigation device. This item shares a lot of similarities with the Melnor XT Mini-Turbo. It also has a twin-row nozzle design and highly customizable spray settings. It also comes with a sled base but it’s weighted so it’s guaranteed to stay in place. It can also be daisy-chained with other same-model units, so you can cover more ground. Due to its size and its guaranteed coverage area of 2300 square feet, this unit is a contender for the best sprinkler for small yard title. It’s also deemed perfect for irregularly-shaped lawns as its compact design will not let you overshoot water spray into your neighbor’s property. As mentioned above, this product is a solid choice if your first priority is durability. It may be made from high-quality plastic but because it’s made in Germany, you can be pretty much guaranteed of top-notch quality construction and material. One downside this product has is that it requires a hose adapter to work. This can be a hassle even if the said attachment is included in the package. Make sure not to lose the part, too, just so you don’t have to worry about finding a replacement. Another seriously heavy-duty lawn irrigation device is the Rain Bird 25PJDAC Brass Impact Sprinkler. It’s a traditional impact sprinkler that is made with die-cast bronze, brass, and stainless steel so it can promise longevity no matter how heavily used your unit may be. Being a classic impact sprinkler, this product only releases water in a steady, straight stream. You can adjust its spray distance from 20 to 41 feet, allowing you to cover a large area. It can also move around up to a 360-degree angle that you can further customize. It can spray in a full or half circle pattern, letting you tailor fit its performance according to the layout of your lawn. This product is also touted as a classic item since its design is patterned after the brand’s original impulse sprinkler that was originally patented in 1933. It boasts of having the same durable construction but with the features of modern engineering. Another fascinating thing about this product is that it uses a simple screw to diffuse the water. This simple addition breaks down the jet so water droplets fall off the stream and hit the ground under it. This guarantees better coverage, letting you water your lawn more efficiently. A lot of people also like the fact that you can connect this product to a hose. Other impact sprinklers need to be installed on the lawn with its own waterline so such a design makes this product a lot handier. This makes it very easy to set up. Note, however, that this product is technically not an oscillating sprinkler. However, it can be a solid alternative, especially if you prefer an all-metal device.